Duck, Duck, Goose is another fun game that keeps children active. This classic game can be slightly altered to include sight words, making it both fun and educational. This game is ideal for children in preschool and early elementary grades. This game is played just like duck, duck goose except for a few twists; a child must read the sight words on each child’s back and then shout out another for the chase to begin. Form a circle – each child should be facing inward. 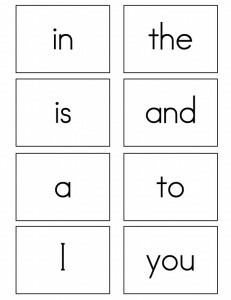 Create sight word game cards. You can use sticky notes or index cards and yarn to make sight word necklaces. Make sure the sight word is on the child’s back so it can be easily read. Oldest person goes first, she is the picker (the fox) and begins the game by gently tapping or pointing to each child (the ducks) as she does, she must read each sight word. Eventually, the picker must select another child (the goose) by gently tapping him. The goose must get up and try to gently tap/touch the fox before she sits in the goose’s previous spot. They should run around the circle one time. If the goose tags the picker, the goose returns to his seat and the picker begins tapping each child/duck and reading the sight words again. If the picker succeeds, she sits in the goose’s seat before being tapped, the goose is the new picker and the process begins again. There are many different ways this game can be played. Each child sitting down can have the same or different sight words. 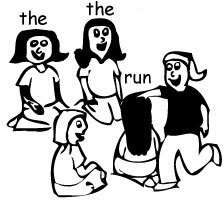 The sight word that is called out can be a verb, e.g., run, walk, jump, or fly (arms out) and dictates what a child should do during the chase. This is our preference. Each situation will lend itself to a different game play. Older children will benefit from different sight words and using verbs in lieu shouting the word, “goose.” Switching sight words after each chase will mix it up and make the game unpredictable. It also exposes a child to more sight words which helps build their vocabulary. Children, who are being introduced to sight words for the first time, should limit the sight words. Each duck could have the same word, e.g., the, and the picker could yell “go” in lieu of “goose.” Another option is to use two words, e.g., the & and. Incorporating sight words with Duck, Duck Goose helps a child develop a sight word vocabulary. 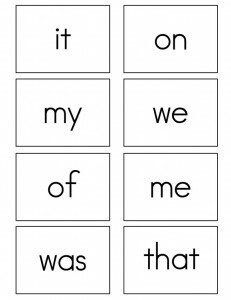 Print out the sight words noted below. Cut out each card, put a hole in each corner and create a necklace using yarn. Make sure the necklaces are very large so they easily fit over a child’s head. For a quicker set up method, use sticky notes and write the sight words that are appropriate for your children or students. 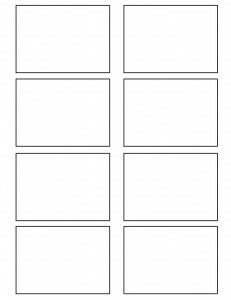 We also provided a blank template below. Click on an image below to obtain a PDF. I am a kindergarten teacher, this is my first on this sight and I’m enjoying the activities so far, i know my students will enjoy them too, will keep u informed.